Heather Thormodson is a community evangelist. Which makes the fact that her family’s business is located in a former church all the more fitting. Heather and her husband Mike own North Star Retreat Center in Ashby. Originally a church, it was also a restaurant and an inn before the Thormodsons turned it into a gathering place for people near and far and groups of all sizes. The retreat center has five large bedrooms—each with its own bath and decorated with handmade quilts— that sleep up to 24 people. There’s a commercial-grade kitchen, a dining room and cozy nooks open to guests. Even the former bell tower offers space for reading and meditation along with a birds-eye view of town. The spacious former sanctuary with its stained-glass windows is now used for reunions, special events and group meetings. When they purchased the building in 2015, the Thormodsons wanted to make sure it became an integral part of community too. It is the home of the Guiding Star Quilt Guild that meets twice monthly, once during the day and once in the evening. The local 4H program is in its third year of meeting at the center. She has even invited the community to use the porch along one whole side of the building as a great viewing platform for festival parades and the annual Christmas tree lighting. 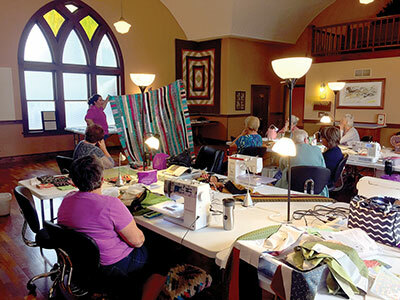 When Heather lined up an international quilt exhibit that she knew would draw hundreds to Ashby, she asked the local garden club and the Presbyterian church across the street to consider providing refreshments for the visitors as a fundraiser for their organizations, and serving as “goodwill ambassadors” with a warm Ashby welcome. They were happy to comply. It’s not hard to guess by now that Heather is an avid quilter. Along with the quilt guild’s regular meetings, Heather has a pop-up store of quilting and other crafting supplies for guild members and interested guests. She even encourages the 4Hers to quilt by hosting an annual quilt retreat just for them. Last year, North Star Retreat Center sponsored its first quilt show held at Swedberg Nursery in Battle Lake in the fall. Empty after the growing season, the large greenhouses became the perfect blank canvas for the quilts on display. Heather is already planning their second quilt show Sept. 28 & 29. She has also scheduled another international exhibit May 11-19 of quilts inspired by the works of Van Gogh. Like the Thormodsons, West Central Initiative also knows about the benefits of partnership and community. Scott Rocholl from Farmers State Bank in Underwood brought in WCI as a partner to help complete the Thormodsons’ finance package to purchase the Ashby building. The bank was able to take advantage of WCI’s Access to Capital loan program, which is designed to make it easier for lenders and loan clients to work with WCI for certain small business financing. The fact that WCI could provide a gap loan to help the Thormodsons achieve their dream of owning a retreat center was a welcome but not complete surprise to Heather. She had worked closely with WCI in a former job. “I was already attuned to WCI and how its programs help local people and communities,” she said. Learn more about the North Star Retreat Center, its accommodations and events at northstarretreat.com. Find out about WCI’s loan programs, including its Access to Capital loan at loans.wcif.org.